Alexander, at the age of twenty, ascended to the Macedonian throne at the death of his father, Philip II, in the summer of 336 BC. Philip had unified the Greek city-states who had pledged allegiance to him. While only a teenager, he displayed excellent military ability. He was tutored by perhaps the greatest Greek philosopher, Aristotle. You can use the map below to follow Alexander's itinerary in solidifying Macedonia and Greece before attacking Persia. On Philip's death, the kingdom was immediately in trouble. Alexander disposed quickly of all conspirators and domestic enemies by ordering their execution. He then descended on Thessaly, which had accepted Macedonian rule under Philip but was now being controlled by partisans of independence. Alexander quickly restored Macedonian rule there. Before the end of the summer of 336 BC he had reestablished his position in Greece and was elected ruler by a congress of states at Corinth. However, other Greek cities like Athens and Thebes who had pledged allegiance to Philip were unsure if they wished to do the same to a twenty- year old youth. Furthermore, northern barbarians that Philip had subdued such as the Thracians, were threatening to break away from Macedonia and wreak havoc in the north. 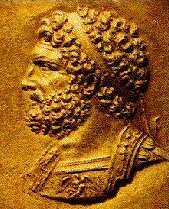 Alexander's advisors urged that he let Athens and Thebes alone and that he be gentle with the barbarians to the north so they wouldn't revolt. Alexander was of a different mind. He knew that he had to secure his northern border if he was going to proceed south to subdue Thebes and Athens and eventually into Asia Minor. Therefore, in 335 BC he marched toward the Danube River to secure Macedonia's northern frontier. Alexander's was perhaps the greatest integrated army of antiquity. He combined heavy hoplite infantry, heavy cavalry, light cavalry, skirmishers, and light forces from several different cultures into an integrated whole. He carried out a successful campaign against the defecting Thracians driving them beyond the Danube River and out of the way. Although the Thracians were fierce warriors, their light armor and inferior weapons made them no match for Alexanders army. On his return he crushed in a single week the threatening Illyrians. His northern border was now secure, however, rumors of his death in these campaigns had spread to Thebes and Athens and a revolt broke out in southern Greece. They felt that the time was now ripe for them to separate themselves from Macedonia. Alexander marched south covering 240 miles in two weeks. In the fall of 335 BC Alexander marched up to the gates of Thebes and advised them that it was not too late for them to reconsider. 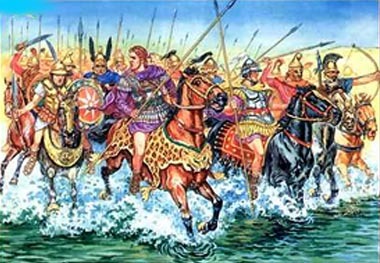 The Thebans responded with a small contingent of troops, which Alexander quickly dispatched. The next day the Macedonians stormed the city, killing almost everyone in sight, women and children included. They plundered, sacked, burned and razed Thebes, as an example to the rest of Greece. Athens then quickly rethought its decision to abandon Alexander and his Macedonians. He came to terms with them that maintained the status quo as under Philip and thus Greece remained under Macedonian control. Alexander was now situated to pursue his campaign against the Persians.